These are words of David. Last week we reflected on King David. I said that King David was like the engine of Israel. 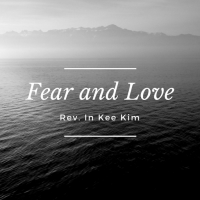 They could never forget King David, and today I’d like to talk about fear in wake of all these things happening and the violence, hatred, and bigotry that are all around us. There are so many people who are trembling with fear. Fear is something that we all have in our mind. It’s probably one of the most powerful emotions that prevent us to live a fulfilling life. We have to learn to overcome our fear. As long as we have fear, we cannot live a life with confidence. Fear itself is not bad. Without fear will not be able to feel the danger that is imminent around us. Fear alerts us and makes us ready to deal with the danger. In Barcelona, Mr. Gray, a Canadian, was right there when the attack happened. With his family two, three children – they’re a little older – as soon as they saw something going on, they ran into a hotel. And then they stayed there for five hours without really knowing what was going on. Mr. Gray, he said the scariest thing in the hotel. What he said was that they didn’t know what was going on. They didn’t know if there was one truck, or they might’ve thought that a group of terrorists might come in with guns, and they were able to hear some gunshots too. So they thought, what if they come into the hotel? What if they’re right here in the hotel? There were so scared, and for five hours they just stayed in that hotel. That is the street where Will proposed to Grace. We were just there a few years ago. And that happened. Fear is a natural reaction from people who face danger, but there’s also fear that paralyzes us. Not preparing us to fight against danger or preparing for the danger, but there is a fear that takes away all our energy and desire. It just makes us feel totally helpless. It paralyzes us. We cannot do anything once we are captured by this fear. We freeze with this fear. Usually, fear comes from seeing the real danger that is imminent around you but this kind of fear has nothing to do with real danger that is imminent to you. It is that they are just thinking about the possibility of danger. For example, if you had a painful memory of failure, you will have fear of failure. You cannot do anything because you have this fear of failure. Changjoo, who is our conductor, he’s going to Australia to study. And yesterday he did a wonderful performance. It was such beautiful music that he powerfully played, and he changed it so much, and we enjoyed it so much. But I’m sure he went through many, many hours of fear of failure. “What if I cannot master this?” But he did not give up. He kept on practicing and playing and ultimately he was able to perform the beautiful piece. We all sometimes have a kind of unnecessary fear. You may say, if you had a big car accident, you will have a fear of driving. If you’re hurt by people, you will have a fear of people or relationships. Some kids are bitten by dogs and even when they’re grown up, they’re scared of dogs. We have learned this fear through painful life experiences and this kind of fear is not always helpful. It takes away energy and confidence from us. It hinders us from living with confidence. It creates neurotic anxiety. Living with this kind of fear is not fun. Living with this kind of fear makes us very passive. You know what fear does? Fear affects the way we see things. Fear makes us see problems bigger than they are. We should see problems as they are. Then we should be able to see the solution, but when you see the problem is much bigger than it is, then you will know you’ll freeze. You will know any solution to the problems. We talked about Goliath and David the Israelites. They saw goliath much, much bigger than he was, so they thought, we have no solution since we’re so scared of Goliath, but David saw Goliath. He could see that Goliath was strong, but at the same time, David was able to see his weaknesses too, and he attacked those weaknesses. That’s how he overcame Goliath. Many times we fall into the problems because we see them as much bigger than they are. We need to learn to see things as they are, then we’ll get better insight about our problems. Don’t pull it up when you have problems. Don’t blow them up. See them as they are, and then you’ll be able to see the solution. You will feel scared not because of our problems, but often because of our fear about problems. If you don’t have fear, you will be able to overcome those problems, but because of fear of your problems, sometimes we feel what David felt. He experienced many crisis in his life. He crept in totally crushed by fear. You know when problems come right before you, you can handle that because you have coming up so you can handle the problems, but once you get home, you sit down by yourself. All of us are have let this fearful thinking and emotion overwhelm us, and we lose there. So David, probably when he was alone, these kinds of fears, all kinds of fears probably attacked, but somehow David knew how to deal with his fear. I think that’s very important, knowing how to deal with fear, because we all live with fear. But how do you deal with fear? This is David’s secret. David said, the Lord is my light and my salvation. Whom shall I fear? The Lord is the stronghold of my life, of whom shall I be afraid. He had confidence in God. Every time a fearful situation arose. He didn’t focus on his fear, but he focused on God. That is the secret of overcoming our fear. When fear attacks us and conquers us, we have to find the area in you that is not affected and occupied by fear. So when fear attacks you, you have to think about the area that is not conquered and occupied by fear. I call that spiritual territory. We all have spiritual territory that is not occupied and conquered by fear. That is the area that we need to hold onto. The part of you that looks to God. When you have the spiritual territory that is not totally paralyzed by fear, doubt will save you from fear. Give special attention to that spiritual territory, that part of consciousness he held onto when everything looks hopeless. That part of consciousness sees hope. When everything looks impossible, that part of consciousness sees possibility. That part of consciousness made David confess in this way. Even though I walk through the darkest valley, I fear no evil for you are with me. Your rod and your staff, they comfort me. After the terrorist attack in Barcelona, people said this, we will not fear. In other words, they paid attention to the future territory. That part of consciousness which is not occupied and conquered by fear. The very next day neo Nazis came out to to make a demonstration, to say that immigration is not good, and Muslims have to be. They came out to proclaim that they fit right there. People in Barcelona came out, said that they will not let our city be conquered by fear. They will not let our city be conquered by racism, and we will not let our city be totally paralyzed by fear. That is courageous spirit. That is the spiritual territory. They paid attention to that consciousness. They held onto that. Evil is not to be feared. Injustice is not to be feared. Patriotism, bigotry, racism, violence are not to be feared. God created us so that we can fight against those things. Fear was supposed to have fear over those things. That’s the future. What is the best way to expand spiritually? I believe that it is love. Love expands that spiritual territory. Love gives you courage. When you have love, you have courage. Now, when you have power, only when you have love, you have courage. Love casts out all fear. This is what John says in 1 John, there is no fear in love, but perfect love casts out. Fear for fear has to do with punishment and whoever fears has not reached perfection in love. Love is what expands the spiritual territory. I hope that your love for God may expand that mutual territory within you. This is what David said, one thing I asked of the Lord that will I seek after to live in the house of the Lord all the days of my life, to behold the beauty of the Lord and tink choir in his temple. He was surrounded by enemies, but he was talking about love for the Lord. He had love for God. Love for God, gave it to them. Courage. Now justice gives you courage. Love for truth gives you the courage. Love for life gives you courage. Be courageous. Don’t fear. Fear and love are like darkness and light. When the light comes, darkness cannot stay. When love comes, fear cannot stay. We love worse within us. Fear slowly disappears from us. You can never be separated from God’s love. In other words, you can always overcome your fear. This is what St Paul discovered. In all these things, we are more than conquerors through him who loved us, for I’m convinced that neither death nor life, nor angels, nor rulers, nor things present, nor things to come, nor powers, nor height, nor depth, nor anything else in all creation will be able to separate us from the love of God in Christ Jesus our Lord. Nothing in the world can separate us from the love of God. Let us not fear the injustice that is not fear, hatred, bigotry, and violence. Let us not fear anything that tries to destroy human goodness. Josh mentioned God is good and goodness will cherish the goodness of God and we will also cherish human goodness. We’ll stand up against anything that tries to destroy the human spirit. God gave the United States so much power, so much resources, so many talented people. They’re supposed to exercise good leadership to build this global community better than it is. I see so much division. “America first.” That’s not a Christian slogan. Christian slogan is others. First Task Christian slogan. That’s not Christian message. This is the time to stand up with courage. I’m glad that there’s demonstrations everywhere in cities, big cities, Boston, Britain, and everywhere. This is the time for us Christians to stand up for what we believe, have courage, live out what Jesus commanded you to do. Don’t be silent. Speak up against evil, and any kind of prejudice. This is the time for us to embrace each other. Love each other, accept each other. This swirl, this globe is to be shared, not to be conquered.